To build and develop ME TRANG Coffee to be the global coffee brand. Spiritual connecting all coffee lovers all over the world and bring Me Trang Coffee culture to other countries. Acquired top 50 Gold Products of 2011 for Super Clean Coffee MC. Achieved Gold Prize for Vietnam high quality goods for years from 2006 – 2011. And also gained many other prizes and recognition. End of the Fair, Me Trang coffee JSC initially impress and attract the buyers, importers and major distributors in the United States. As a result, some contracts and memorandum were signed. 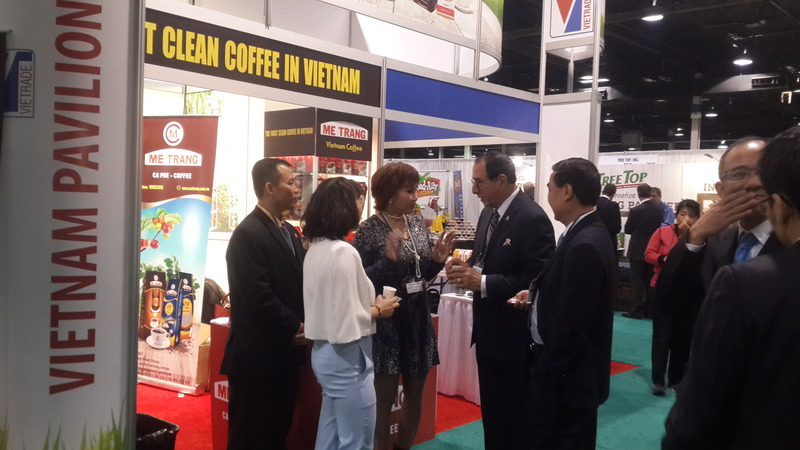 In particular, the presence of the Me Trang coffee brand at the largest food and baverage fair in North America has created trust in buyers and contribute to branding Vietnamese agricultural food and beverages to American market. Our company directly manages material areas clean, free of residues of plant protection products, no harmful chemicals or preservatives. Metrang’s Coffee Company has created a unique coffee flavor, featured with the tastes of the local people, and with ethnic identity. The taste of Metrang’s coffee is kept pure coffee taste thanks to a roaster and a separate recipe. Metrang’s Coffee is produced on entirely closed lines, modern technology with the advice and supervision of scientists. Numerous of product diversity, richness, meet needs of many consumer groups. Products are processed, checked to ensure food safety, make good benefits for the health of consumers.